Marsh, James H.. "Quebec Conference of 1864". The Canadian Encyclopedia, 25 January 2019, Historica Canada. https://www.thecanadianencyclopedia.ca/en/article/quebec-conference-of-1864-feature. Accessed 20 April 2019. There was no media circus surrounding the conference. The press was banned from the discussions, so the newspaper reports said a great deal about the miserable October weather, but precious little about what was discussed in the meetings. In recent years it has become unfashionable to credit the dead white male "fathers" of Confederation for the deal that they made in Quebec City in October 1864. Yet, judged by the abject failures of the constitutional palaver of the 1990s, the conference of 1864 was a resounding success. The St Louise Hotel, a respectable hostelry on St Louise Street, was engaged to accommodate the delegates and families from Newfoundland, PEI, Nova Scotia and New Brunswick. The sessions themselves took place in the reading room of a nondescript building perched near the edge of the high cliff of Upper Town. A long table was brought in and covered with blotters, notepaper, inkbottles and pens. Through the high, arched windows, the magnificent St Lawrence, the "River of Canada," was in plain view. At the Quebec Conference, charcoal sketch by Robert Harris (National Gallery of Canada, Ottawa). The Quebec Conference assembled for its first session at 11 a.m. Monday morning, October 10. The Canadian hosts were well prepared. They were desperate to find a political solution to the years of deadlock that had paralysed the government of the United Province of Canada. The bloody Civil War raging in the United States provided an ominous backdrop. From the very beginning John A. Macdonald dominated the proceedings. It was he who rose dramatically to introduce the scheme of union, for no one else approached his experience, his grasp of the political labyrinth or his sheer will power. His resolution carried after a four-hour discussion - a good beginning. On day two Macdonald rose to sound emphatically his belief in the need for a strong central government. Above all, he was anxious to avoid the fatal errors that had wrecked the American constitution. Macdonald would have preferred a legislative union, with a single Parliament and no provinces but he knew that idea would not fly. Quebec and Ontario were sick of staring each other down across the floor of a single legislature and the Maritime provinces were not going to surrender all their autonomy. It was George Brown of Ontario who outlined the scheme of government, that it "should be federal with local governments in each province." Debate on the make-up of the lower house, the Commons, was mercifully swift. All agreed that there should be representation by population. It was a basic principle much beloved by Brown and his Grit party. It meant that Ontario would have 89 representatives and PEI only 5, a contemptible number in the Islanders' view. The debate on the make-up of the upper house, the Senate, was far more acrimonious and almost broke up the conference. An 18th-century French politician, Abbé E.J. Sieyès, had nicely summarized the fundamental problem of any upper house. "If the upper house agrees with the lower it is superfluous, if it disagrees, it ought to be abolished," he wrote. Several Maritimers argued that the provinces should have equal representation in the Senate. How else, argued Andrew Macdonald of PEI, could it perform its role as guardian of the rights and privileges of the provinces? The conference begged to differ and moved to accept the principle of "sectional" equality, with the Maritimes together getting the same number of seats as each of the Canadas. PEI dissented. The resulting appointed Senate certainly did not please everyone, then or now. The lucid Quebec delegate Christopher Dunkin called it "just the worst body that could be contrived - ridiculously the worst."
Throughout the tense debate, the social atmosphere remained as festive as the weather remained uncertain. Every evening Governor General Lord Monck hosted a lavish dinner with elaborate menus and copious wines. The last serious debate focused on the matter of "residual powers." Should the powers not mentioned specifically in the constitution go to the central government or to the provinces? On October 24 trouble broke out when George Coles of PEI moved that residual powers should reside with the provinces. The suggestion agitated Macdonald who responded vehemently. To grant residual powers to local legislatures was to adopt the worst error of the American constitution, he raged. "It would ruin us in the eyes of the civilized world. " After John A. 's diatribe, not even PEI voted for the resolution. Late afternoon on Thursday October 27 the Quebec Conference drew to a close. At 4 p.m. the Maritimers left on a special train arranged to get them home. A second group departed by regular Grand Trunk Railway night express at 9 p.m., among them Macdonald. 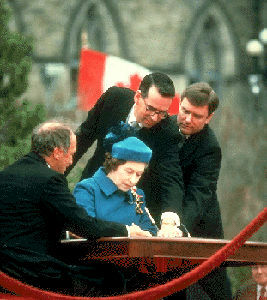 In his luggage were all but three of the 72 resolutions that became the Canadian constitution, each on a slip of paper written in his clear, flowing hand. The constitution that emerged was, as Thomas D'Arcy McGee called it, "a scheme not suggested by others, or imposed upon us, but the work of ourselves, the creation of our intellect and our own free, unbiased, and untrammeled will."